Posted on March 21, 2017 by Katharine L.
Escape From Mr. Lemoncello’s Library was one of my top ten favorite books that I have ever read. This book is more than a rib-tickling novel full of humor and suspense. It’s a game in itself, in which readers can have fun solving clues and answering riddles while learning how to navigate the Dewey Decimal system. This book actually reminded me of the book Charlie and the Chocolate Factory. In Chris Grabenstein’s tale, twelve sixth graders are chosen to be the first ones allowed into an eccentric billionaire’s library. This fast-paced novel features an eccentric billionaire who welcomes a group of children into a fantasy setting full of weird, wondrous touches. This billionaire’s name is Luigi. L. Lemoncello, and he reminded me greatly of Willy Wonka in Charlie and the Chocolate Factory. The main character in Grabenstein’s book is a boy named Kyle Keeley. Kyle is a game fan—board games, word games, and especially video games! Kyle’s hero, the famous gamemaker Luigi Lemoncello, is the genius behind the design of the town’s new public library, which contains not only books, but an IMAX theater, an electronic learning center, instructional holograms, interactive dioramas and electromagnetic hover ladders that float patrons up to the books they want. How awesome is that? (I’ve always wished that there was a library that was just as cool as Mr. Lemoncello’s!). However, there’s a twist. The next morning, after touring the library, the doors remain locked, and that’s where the twelve kids find out about Lemoncello’s fantastic new game…except that it involves them. Kyle and the others must follow book-related clues and unravel all sorts of secret puzzles to find the hidden escape route out of the library if they want to win Mr. Lemoncello’s most fabulous prize ever. However…can twelve kids solve the puzzle that the clever Lemoncello set for the them? They will either succeed…or fail. 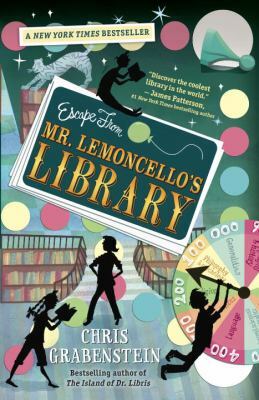 Escape From Mr. Lemoncello’s Library is available for checkout from the Mission Viejo Library. It is also available for download from Overdrive.